SLP has laboratory space in Fisher Hall and access to the anatomy lab in the nearby Rangos Health Sciences Building. 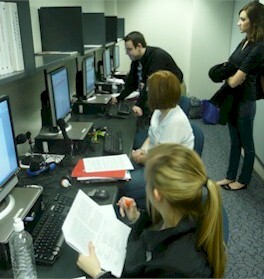 Our lab space is used for faculty and student research and as an adjunct to classroom learning. The Research Lab is located in Room 413 Fisher Hall and is used by multiple faculty members and students for a wide range of research projects. "Effects of Context on the Communicative Performance of People with Aphasia"
"The Role of Prosodic Stress and Speech Perturbation on the Temporal Synchronization of Speech and Deictic Gestures"
The SPPIT lab (Speech Perception/ Production & Innovative Technology Lab), located in 414 Fisher Hall, is a learning laboratory for students and faculty alike . This lab affords computers and advanced software for coursework and work related to clinical practice. 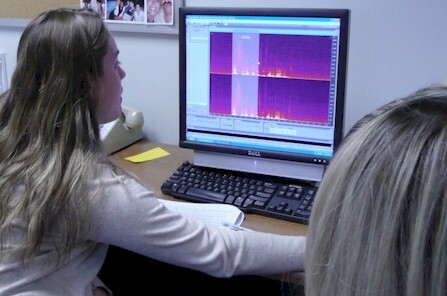 For example, the SPPIT lab is used in the Speech Science course for the analysis of speech or voice samples along a variety of parameters and characteristics. Additionally, students use a variety of programs that are great tools for use in making custom therapy materials. The Augmentative and Alternative Communication lab, located in 414 Fisher Hall, is used by students to gain hands-on experience with various AAC devices and complete lab assignments which are part of the AAC class. This lab is open to students for use at any time and provides materials for the students to utilize in their therapy sessions. As a part of the coursework, students have the opportunity to work in the Anatomy Lab located in the Rangos Building. While in the lab, students gain hands on experience working with human specimens as part of the Anatomy and Physiology of Speech and Hearing course.